Track B1 from "The Lord Of The Rings - Vol. 1, The Fellowship Of The Ring, Book 2, Chapter 1 - Many Meetings". Track B2 from "The Lord Of The Rings - Vol. 1, The Fellowship Of The Ring, Book 1, Chapter 1 - A Long Expected Party". Track B3 from "The Lord Of The Rings - Vol. 1, The Fellowship Of The Ring, Book 1, Chapter 3 - Three is Company". Track B4 from "The Lord Of The Rings - Vol. 2, The Two Towers, Book 3, Chapter 4 - Treebeard". Track B5 from "The Lord Of The Rings - Vol. 3, The Return of the King, Book 4, Chapter 1 - The Tower of Cirith Ungol". Track B6 from "The Lord Of The Rings - Vol. 1, The Fellowship Of The Ring, Book 2, Chapter 8 - Farewell to Lórien". Track B7 from "The Lord Of The Rings - Vol. 1, The Fellowship Of The Ring, Book 2, Chapter 3 - The Ring Goes South". 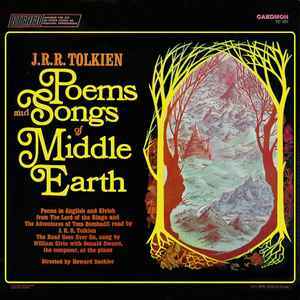 Track B7 (refrain) from "The Lord Of The Rings - Vol. 1, The Fellowship Of The Ring, Book 2, Chapter 1 - Many Meetings". Track B8 from "The Adventures Of Tom Bombadil". This version: blue and green labels.